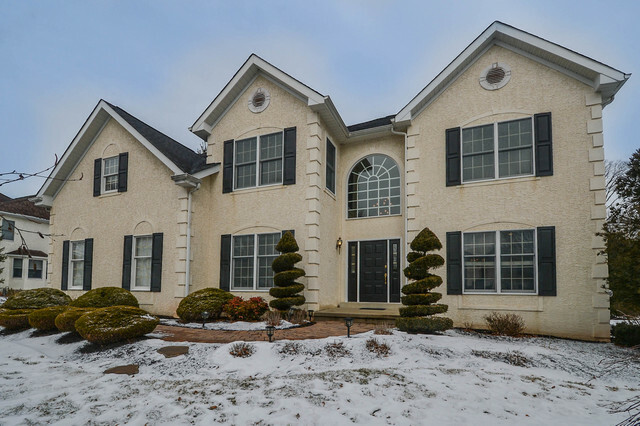 Welcome to this beautifully maintained Colonial located on a cul-de-sac street in Northampton Crest, Bucks County. Enter this home into the two story foyer with turned staircase that flows into the formal living & dining rooms with large windows and columns. The open & airy floor plan includes a cook's delight gourmet kitchen with 42 inch wood cabinetry, abundant counter space, stainless appliances with gas cook top, built-in wall oven & micro-wave. There is a huge breakfast room with large windows overlooking the rear yard with trees. The breakfast bar overlooks the sun drenched family room which features vaulted ceilings with skylights & ceiling fan, fireplace with custom mantel and back staircase. There is a first floor office, powder room and laundry room. The upper level includes a master suite with sitting area including built-in book shelves with window seat, full bath with soaking tub and walk-in closet with custom built-ins. There are three additional large bedrooms and hall bath. The finished multi-use lower level features a large game area & three additional finished rooms plus storage area. The many upgrades include recessed lighting and light fixtures, chair rail and crown molding, upgraded flooring includes wood & tile, 9 foot ceilings on first floor, ceiling fans, Anderson windows, two zone heating with central air and freshly painted. The outside living includes a large paver patio overlooking the beautiful open yard with trees in rear for privacy . Extensive landscaping surrounds this home which includes a beautiful array of flowering plants and shrubs. This home will be a pleasure to show! !